Is this bird plotting a murder? Red-throated Caracaras (Ibycter americanus) are impressive birds that are brightly coloured, extremely loud, and travel around the forest in gangs. They seem to act as if they own the forest, and alarm call vigorously whenever they see you or any other potential threat. I have seen them chase away Harpy Eagles (as have others! ), as well as Toucans. Sounds like a badass bird! If you do a Google Scholar search for “Red-throated Caracaras and Predation“, you might find some surprising things. In the primatological literature, they are listed in several papers (1-2) as being predators of Saguinus mystax, the Moustached Tamarin, a small monkey. This is quite odd, as to my knowledge there is only a single account of Ibycter americanus taking vertebrate prey: Anolis and Ameiva lizards found in the stomach of a single bird shot in Mexico (3). Certainly, other caracara species, such as the similar, but more distantly related Black Caracara (Daptrius ater) do prey on vertebrates. 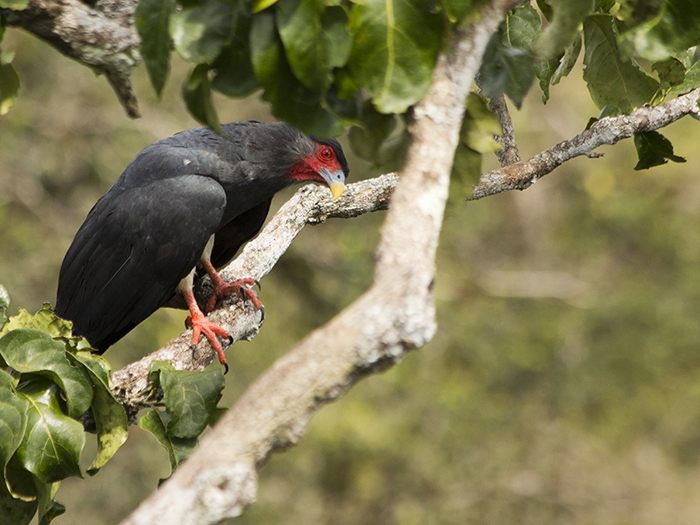 The Black Caracara has been reliably reported preying on fish (4) and juvenile caciques (5). But the Red-throated Caracara is a different species, with different habits, and is not well-known to take vertebrate prey. So where does this idea come from? Now to be fair, I have been attacked by Red-throated Caracaras (see video), but I never have inferred from this that these birds were trying to prey on me (Although one did strike my ear while I was climbing their nest tree). Or perhaps I didn’t take it personally! The following video was taken by Tanya Jones in 2009, and shows a group of Red-throated Caracaras diving at me as I climbed their nest tree. I am located right behind the bromeliad; part of my foot is visible below. And that is the danger of inferring predation by witnessing one antagonistic encounter between two species, with no video records or stomach contents. Because in my book, predation involves killing and eating the prey, and this was not observed here. In fact, my research, as well as one other study, show that the predominant food items consist of wasp larvae and fruits (7,8), with not a single vertebrate among them. I would not say that Dr. Ramirez’ observation constitutes predation. ’cause doesn’t this look better than a monkey? What I interpret this situation to have been is a mobbing attack on monkeys by caracaras defending a nest site, or merely defending their territory from occasional nest predators. I have seen caracaras chasing Toucans in a similar fashion. I have no doubt that the caracaras could kill, and possibly eat a tamarin (They have an average mass of around 500 g, or roughly the size of a small caracara), but surely some stomach contents would have showed up to indicate such an event. Other than the account of lizards in the one shot in Veracruz, I can find no such records. Thus I think that it is definitely premature to list the caracara as one of the “known predators of Saguinus mystax”. Instead, I would probably put the two species in a long list of “animals in the jungle that don’t like each other very much” and leave it at that. There is still much we do not know about this charismatic bird, or indeed about the trophic relations of rainforest animals in general, but hasty generalizations from a single observation are unlikely to improve matters. Heymann, E., and V. Schaik, 1990. Reactions of wild tamarins,Saguinus mystax and Saguinus fuscicollis to avian predators. International Journal of Primatology 11: p.327–337. Lledo-Ferrer, Y., A. Hidalgo, E.W. Heymann, and F. Peláez, 2009. Field Observation of Predation of a Slate-Colored Hawk, Leucopternis schistacea, on a Juvenile Saddle-Back Tamarin, Saguinus fuscicollis. Neotropical Primates 16: p.82–84. Lowery, G.H., and W.W. Dalquest, 1951. Birds from the State of Veracruz, Mexico. In University of Kansas Publications, Museum of Natural History. p. 556, Lawrence, Kansas: University of Kansas Publications. Olmos, F., and I. Sazima, 2009. Fishing behaviour by Black Caracaras (Daptrius ater) in the Amazon. Biota Neotropica 9: p.2–4. Robinson, S.K., 1985. Coloniality in the Yellow-Rumped Cacique as a Defense against Nest Predators. The Auk 102: p.506–519. Thiollay, J.M., 1991. Foraging , home range use and social behaviour of a group-living rainforest raptor , the Red-throated Caracara Daptrius americanus. Ibis 133: p.382–393.